WOW!! 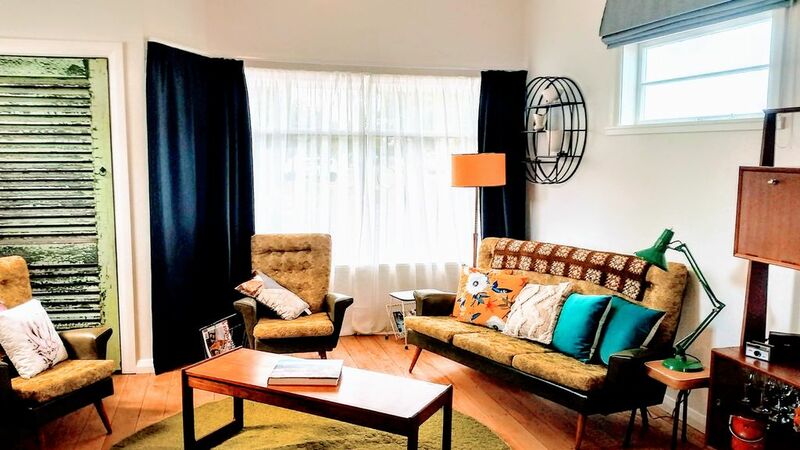 recently renovated 1bdrm villa, luxury retro style with all the comforts of home. Kitch comfy lounge with freeview TV. Large kitchen with Nespresso machine and dishwasher, large bedroom with comfy queen bed. Huge bathroom with large shower and endless hotwater. Lovely garden with private outdoor dining area, BBQ and free bike hire! Kick your shoes off and relax! Please inquire regarding pets as our property is fully fenced. Trent and I are keen 2nd hand shoppers, we love the arts and DIY. We lovingly renovated this villa as we could see its amazing potential. We love Wanganui and its hidden gems. We will give you a taste of whats on offer here, you will love it. Close to shops, close to parks and river. Feels like a home away from home in your own little world. Fantastic leafy garden area, with BBQ and outdoor dining area, which captures all day sun. Warm little house which is central to everything. You will find our house cosy and private. Retro dining table which seats four, but can extend out to a larger area. Our house is adorned with retro memorabilia it will take you back to the good ole times, you will feel relaxed and revitalised. Take a walk out to the grassy private backyard and you will feel like you are in paradise amongst massive olive trees, lemon, mandarin and cabbage trees for that tropical look.